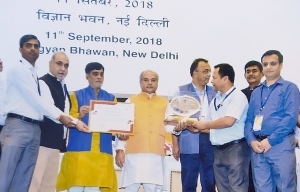 Himachal Pradesh received the 2nd Prize under Innovative Best Practices for the National Social Assistance Program on 11th September 2018 at Vigyan Bhawan, New Delhi. The function was organised by the Department of Rural Development. The award has been given for using innovative practices in the distribution of social pensions. The prize was received by the Department of Social Justice and Empowerment, Himachal Pradesh and NIC HP officers from the Union Minister for Rural Development and Panchayati Raj, Sh. Narendra Singh Tomar. Also present on the occasion were Sh. Kripal Singh Yadav, Minister of State for Panchayati Raj and Secretary, Rural Development, GoI. Sh. Lalit Kapoor, ASIO NIC HP and Sh. Ashish Sharma, Scientist B received the award on behalf of NIC while Sh. Robin George, Joint Director and Sh. Inder Singh represented the Department of Social Justice and Empowerment GoHP.